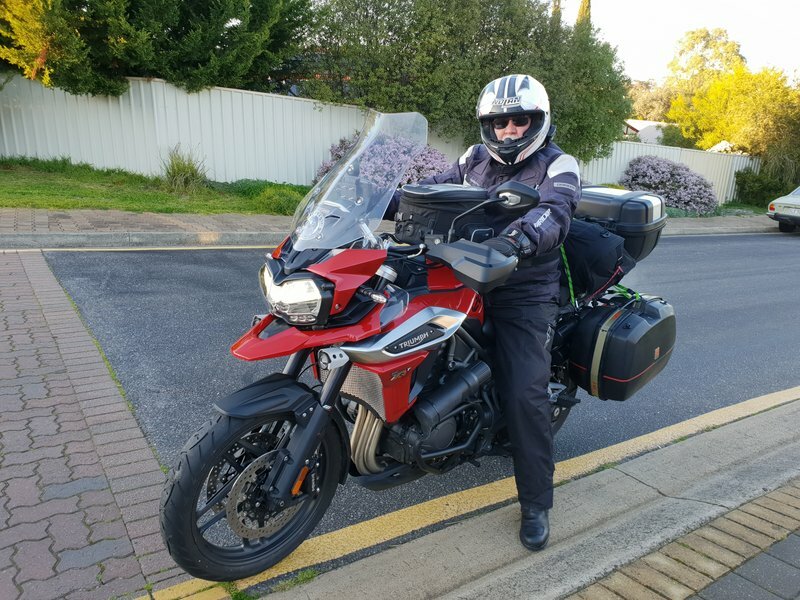 I'm doing a round Australia trip on my Tiger1200, with a mate on a BMW R1200R. We will follow mostly the sealed coast roads. It will take 2+ months. Going clockwise from Adelaide. British people may not appreciate what its like to ride over here. Its a long way between towns, once away from civilisation. So what is needed is a mile-muncher of a bike. My Tiger1200 does it admirably. I'm not the least bit sorry I spent a heap swapping from the 2015 TEx to the 2018 Tiger. I'm carrying quite a few tools (even if I may not know how to use them), and we both have tents for use in emergency. I've started a blog, which I may or may not keep updated, with varying degrees of attention and quality. I'll be using my phone to track my progress. The app 'Bubbler' sends location updates to SpotWalla. All free. I'll have a laptop with me, so will still be online from time to time (like now, posting this). Sounds like it will be a great trip. Look forward to reading more about it as you go. KenW, may you have an awesome trip I'll be following your posts. Best of luck ! Great stuff, keep us posted as often as you can. Good luck. Safe and happy travels for yourself and John, we'll be following your trip so don't forget to take plenty of photos!! Hopefully by the time you arrive in Melbourne the weather will be a bit more on the warmer side. Watch out for the idiots on the Great Ocean Road, who seem to think they can just prop in the middle of the road for a photo, or turn right without indicating, just as you overtake them. Full of hazards that road, even the surface. Getting very windy as we are about to leave Ceduna tomorrow. Will impact our fuel usage. And make riding a bit dicey. We chatted to a 4WD & caravan guy fuelling up who'd just come from the west. He said they had to slow down to 80 to keep control of the van. Those who didn't were wandering all over the road. Hopefully we will see whales at Head of the Bight tomorrow. We will probably go inland a bit down the east coast, to avoid rental vans and trucks/semis. Scary moment this morning in the middle of the Nullarbor (leaving Eucla). Console reported key fob out of range. As has happened with others, I suspect it was the phone tower nearby which upset it. I put the fob right next to the receiver -still gave the error. However the bike started OK, and once away from the tower all seemed well. I don't really need that keyless ignition!